Bitcoin Mining in 2018 - Knowledgebase - MineryTech Solutions, Inc.
Mining has been tough in 2018. 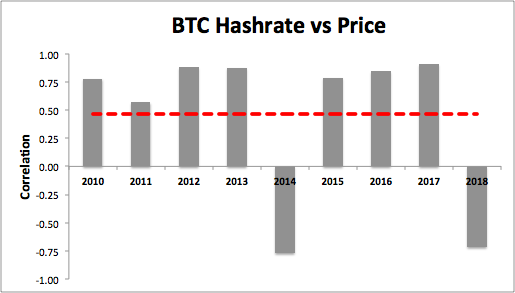 Hashrate has skyrocketed (followed by difficulty) and prices have fallen dramatically. These two in tandem have led to a fall in profitability for miners. The economic logic behind this does not make sense. If the price of crypto falls, less people should be incentivized to mine leading total network hashrate to drop. With a drop in network hashrate, miners would receive a large portion of the reward (to offset the fall in prices). If you draw a historic correlation between hashrate and price you would find that this relationship is generally true. Since inception there has been a strong positive correlation. However, there have been two outlier years. 2018 is one of them. We believe that you can draw many similarities between 2014 and 2018. Although mining in 2018 has been tough we are hopeful that the correlation between hashrate and bitcoin price will re-adjust to its equilibrium (+0.8) and mining will become profitable again in 2019. Below we describe our view on the similarities. In 2014 Bitmain began ramping up production of its flagship ASIC, the Antminer. In the beginning of the year sales for their S1 skyrocketed, they quickly followed up with the S2 (March) and S3 (July). This was the first ever release of mass-market ASICs and miners from all over the world were buying into it. The result was a large spike in hashrate never seen before on the bitcoin network. The end of 2013 saw a massive increase in the price of BTC. On October 3rd it was a mere $117 USD/BTC. By December 4th it has climbed to $1,151, a 883% gain in two months’ time. This was largely driven by the success of the China-based bitcoin exchange, BTC China, penetrating their local market and Baidu announcing that BTC would be accepted on their platform. This all came crashing down, when on December 5th, the People’s Bank of China prohibited Chinese financial institutions from using BTC and Baidu dropped BTC from their platform. To add onto the selloff, in early February 2014, one of the largest bitcoin exchanges, Mt. Gox suspended withdrawals citing technical issues. By the end of the month, they filed for bankruptcy amid reports that 744,000 bitcoins had been stolen. Investors/consumer confidence plummeted with the price of BTC. The increase of hashrate in 2014 due to a push of new hardware is similar to what we have seen so far in 2018. In 2017 Bitmain released its Antminer S9. For months this model dominated the market due to its relatively low cost and high computing power. The price of the machine increased dramatically given the limited supply. In response Bitmain ramped up production. However, in 2018 Bitmain’s competitors such as Bitfury, Halong, Ebang, Pangolinminer and Innosillicon, began delivering quality miners to the market. Bitmain was left with tens of thousands of old S9’s in inventory. They responded by slashing prices and dumping the remaining supply onto the market. In 2018 the hashrate has continued to rise significantly, much like 2014. Another similarity can be drawn between the prices of Bitcoin in the end of 2013 and 2017. Both periods saw large run-ups of the price of Bitcoin. Most of this was due to speculation, and positive news around adoption. By the new year both bubbles burst and the price of crypto fell dramatically. In 2018 this drop was largely due to South Korea cracking down on crypto and Stripe backing out of accepting it as a payment. Similar to 2014, 2018 has been a tough year for miners. Rewards have plummeted, resulting in many giving up mining altogether. The negative correlation between the price of Bitcoin and the total hashing power will likely continue for the near future as the large ASIC manufacturers continue to deliver new products into the market and dumping existing supply at low prices. However, in the long run we should see a return to the mid 80’s in correlation, due to the economic incentive model supporting the relationship. We are hopeful that 2019 will resemble something more similar to 2015 and miners once again will be able to generate strong profits.